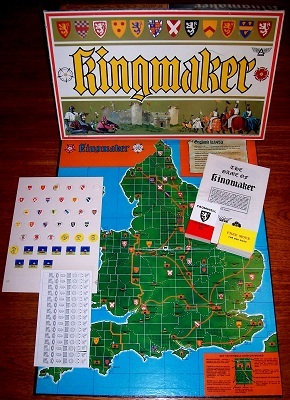 'KINGMAKER' BOARD GAME: Kingmaker recreates the exciting period in England's history best known as the Wards of the Roses. The game takes as its basis the concept that the dynastic struggle between the royal houses of Lancaster and York was in reality a series of brutal and bloody power struggles between factions of self-interested noble families, with the Yorkist and Lancastrian princes the pawns in a greater game of gaining control of the country in the name of one or other monarch. Players control pieces representing the noble families as they seek power by a combination of military, political and diplomatic skills. This game is fully complete and in good condition. The box shows some signs of wear, however the contents are in fantastic condition as though barely played with.